Thank you to Artist Israel Bernal Lopez for his stunning shark creation, currently displayed in front of the Eldredge Library in Chatham. Shark-Gaudi, in the style of Barcelona's celebrated Gaudi park, Parque Guell, features a colorful mosaic. Israel Bernal Lopez cut every piece of glass and mixed every drop of mortar in this exquisite project. Visit the Sharks in the Park if you have a chance! They are on display through August, and the online bidding is open until August 17th at 12pm. We are honored to be a part of this tradition of public art and fundraising! Which Whale will you find in our bookstore? One of the 35 Whales featured in this summer's scavenger hunt brochure is hidden in our bookshop. We can't celebrate it here yet, since kids are still searching, but we are grateful to the artist for creating a hand-painted creation for us to display! This year hand-painted whales are swimming in the shops for our summer visitors to find and win gifts from the Chatham Merchants Association, to be awarded at the end of September. 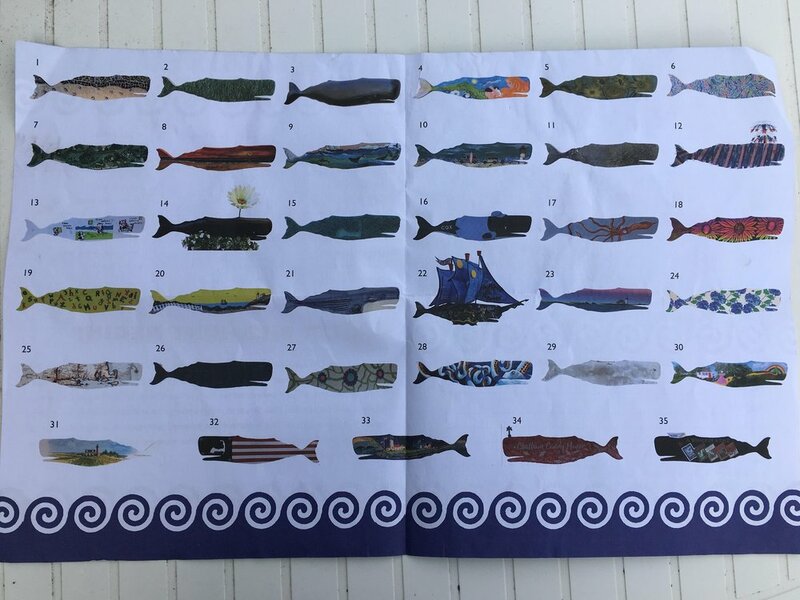 There are 35 three-foot painted and decorated whales scattered in shops and businesses all around town; your challenge is to sight all of the whales, correctly identify which business or shop they are in, and hand your completed scavenger hunt booklet in for a chance to win one of five grand prizes. Where are the Whales headquarters are in the Downtown Visitor Information Booth where you can obtain the scavenger hunt booklets. Search your way through the various shops to match the whales to the correct location. Each person handing in a completed booklet will receive a prize. The booklets are also available in participating downtown shops as well as the Captain Bassett House Visitor Center in South Chatham. 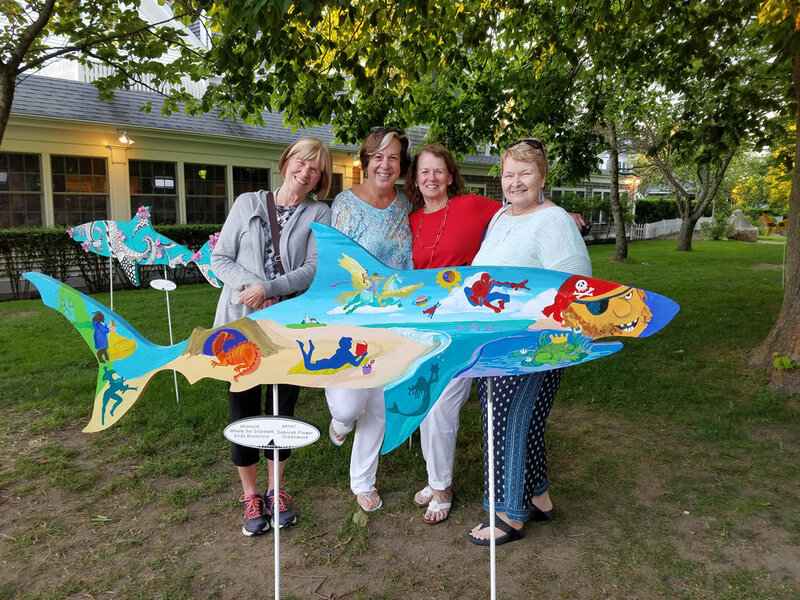 The Chatham Merchant's Association has sponsored another year of SHARKS IN THE PARK - beautiful, handpainted sharks created by local artists. Our sponsorship was for an imaginative world of a child reading on a beach by the talented Deborah Fowler Greenwood. Learn more here! Thank you to those who visited our shop in search of the gorgeous hand-painted whale: "A Child Who Reads Will Be an Adult Who Thinks." Our talented staff member Deborah Buxton Goldberg designed and painted the beautiful whale featured below. Thank you to the artist for sharing her work with us!